Immigration is already an expensive, difficult process for anyone—but it might soon become even harder for immigrants with disabilities. In October 2018, the Department of Homeland Security proposed a rule change to existing laws surrounding immigration known as public charge. The idea of public charge was first introduced into U.S. immigration policy in 1882. In current law, under section 212(a)(4)(A) of the Immigration and Nationality Act (INA), a person seeking admission to the U.S. or seeking to adjust status to permanent resident is inadmissible if they are deemed “likely at any time to become a public charge.” Someone is considered a public charge if they are “likely to become primarily dependent on the government for subsistence, as demonstrated by either the receipt of public cash assistance for income maintenance or institutionalization for long-term care at government expense” according to U.S. Citizenship and Immigration Services. In other words, public charge is based on the assumption that people with disabilities will be too expensive for the country we immigrate to, and that it’s more likely we’ll need costly healthcare (Medicaid) or social supports (SNAP and other food assistance, housing subsidies, SSI or SSDI). And therefore, the government believes we shouldn’t be able to legally immigrate. 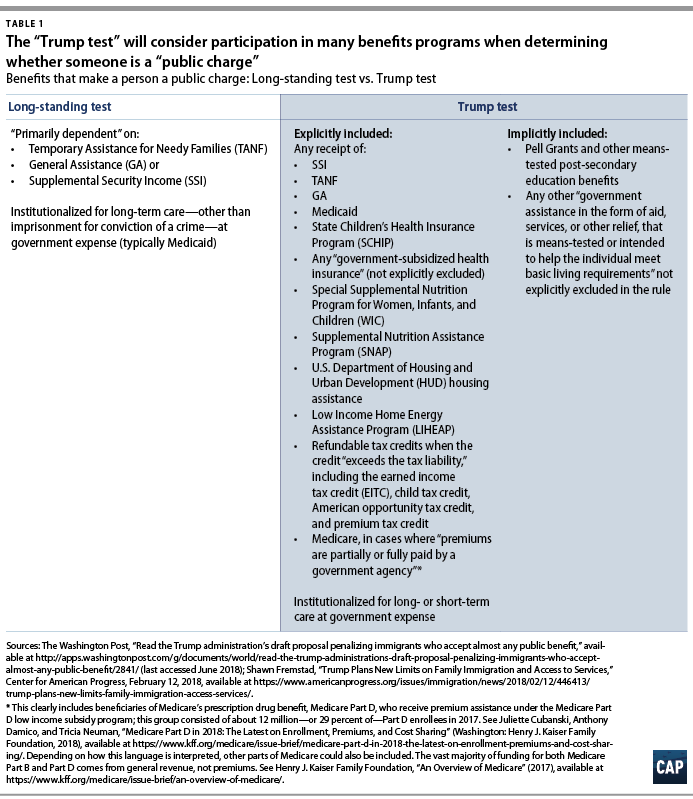 How does the proposed public charge rule impact a disabled adult immigrating alone, or a non-disabled family immigrating with a disabled child? Under the proposed rule, immigrants with disabilities face an even greater risk of being labeled a public charge. The current public charge law is specific and only includes people who use cash benefits, but the proposed rule change would expand public charge to include non-cash benefits, such as Medicaid, food assistance (i.e. SNAP), and housing subsidies (i.e. Section 8 housing). Additionally, the proposed rule provides more guidance to immigration officials who are currently charged with using a “totality of circumstances” test to determine whether someone is likely to become a public charge. The proposal explicitly names five “heavily weighted negative factors” to determine whether someone will be a public charge. The proposal lists only one “heavily weighted positive factor” that relates to how much money the immigrant or a sponsor of the immigrant makes in the U.S. The positive factor would be if the applicant meets 250% of the Federal Poverty Line (an income of $62,750 for a four person household). Receipt of Public Benefits within 36 months of filing application. Blocking low-income and disabled immigrants could have an expensive impact on the government, as more people choose to forgo Medicaid and insurance through the Affordable Care Act, or parents decide not to take their kids in for check-ups. According to the Migration Policy Institute (MPI), public charge could cause as many as 6.8 million non citizens to stop using benefits out of fear. Public charge is not just an immigration issue in the United States, either. In Canada, roughly 361 immigration cases a year were refused from 2013 to 2016 because of the excessive demand provision in the Immigration and Refugee Protection Act. Under Section 38(1)(c) of the Act, an immigrant or refugee could be deemed inadmissible if their pre-existing medical conditions could cause an excessive demand on Canada’s health or social services. An excessive demand is defined as exceeding an average Canadian per capita health fee of just under $6,655 annually. That changed in 2018, when Prime Minister Justin Trudeau’s administration announced wanting to reform Canada’s immigration policy to make it easier for people with disabilities and their family to immigrate to Canada. These major reforms to Canada’s immigration policy were announced by Canada’s Immigration Minister Ahmed Hussen. The changes to the law will alter the definition of social services and remove references to special education, social and vocational rehabilitation services, and personal support services—and triple the cost threshold (to $20,000) at which an application for permanent residence can be denied on medical grounds. These changes will make it so that special education, rehabilitation services, and personal support services no long count against applicants, and makes it easier for both disabled individuals and families of disabled children to apply for permanent resident status. These changes make it considerably easier for people with disabilities and families of disabled children immigrating to Canada. Samrat Saha, 38, and his family were denied residency in Canada in May 2017 because their son has autism. Saha can now reapply for permanent residency. Advocacy groups in Canada like the HIV/AIDS Legal Network, Council of Canadians with Disabilities, and the Migrant Workers Alliance don’t think the changes to the law go far enough, and the government should eliminate medical inadmissibility altogether. One family, the Warkentins, moved from Colorado to Manitoba in 2013, but their application for permanent residency was denied because their six-year-old daughter has epilepsy and an intellectual disability. The Warkentins had already gotten involved with their local church and community, invested over $600,000 to the Canadian economy, and planned to open a hunting and fishing lodge business. Their contributions weren’t considered with their application, only the potential cost to the Canadian government. Advocates say this will continue under the new changes to the law. According to immigration critic Jenny Kwan, 25 percent of all immigrants with pre-existing conditions could still face discrimination. 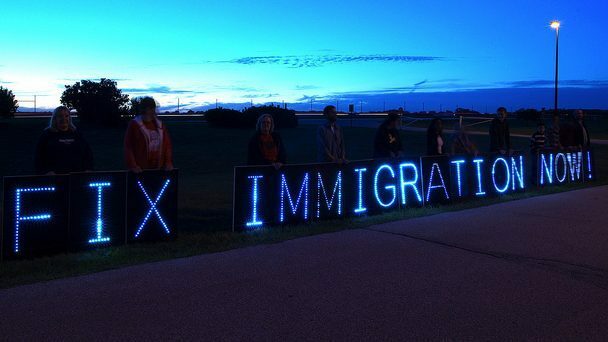 How can we reform immigration policies to make them fairer? She explains that public charge rules are driven by the need to determine who is worthy and who isn’t by factors including race, health, class, education, disability, and others. We all have the power to advocate against public charge and stop the proposed rule change in the United States. If you’re interested in taking action, you can comment on the proposed public charge rule. The Department of Homeland Security will be taking comments until December 10, 2018. It’s critical that the disability community and beyond send in as many comments explaining why the public charge rule change is discriminatory. Disabled people are human beings and have the right to immigrate safely to the United States and other countries just like non-disabled people do. People with disabilities make meaningful contributions both financially and in other ways like community involvement, art, and volunteer work, but our value as immigrants also shouldn’t be solely judged by our ability to contribute. Our differences shouldn’t make us less welcome. Alaina Leary is an editor, social media manager, and activist living in Boston, Massachusetts. She is a social media assistant for We Need Diverse Books. Her work has been published in Washington Post, Boston Globe Magazine, Cosmopolitan, Teen Vogue, Chicago Tribune, Seventeen, Marie Claire, and more. You can find her on Twitter and Instagram @alainaskeys.